If you are in need of professional print design services, why not consider Graphically Innovative Designs. As the owner and graphic designer, I ensure that all my services are done to my customers' satisfaction and my high standards. Designing marketing materials that are attractive but also effective is what I believe in. Investing in effective marketing materials brings in and keeps customers coming. Some of the items that I design are listed below. If you are interested in having any of these items below designed or something that may not be listed, contact me for my services. All Print Design services are done under these Terms and Conditions. I work with my clients individually to make sure they receive the best work possible. I have a unique process, unlike other graphic designers, where I take time to get to know my clients through a questionnaire. 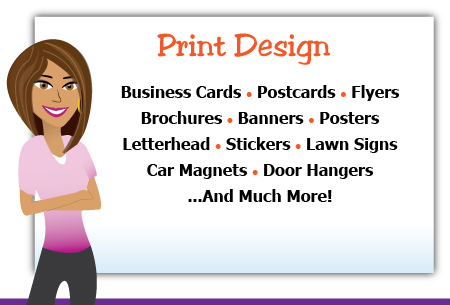 From the information gathered, I make custom and affordable designs for their small business. Do you ever wonder if it is time for your business cards to have a check-up? Or if your business card is effective? I offer free evaluations of business cards for small business owners to see how effective your business card is in terms of its design and wording. Click here to find out more. It's not everyday that you have to work with a designer like me. So I can understand if you may feel a little shy about the process. Check out my page about My Print Design Process to find out what you can expect while working with me and how a project usually works from start to finish.